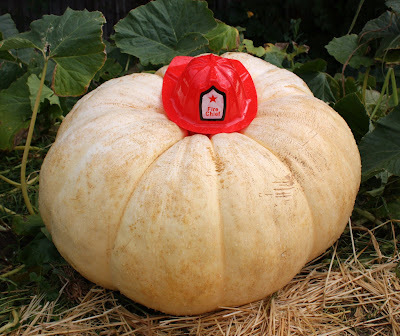 This is a 230-pound white pumpkin, one of several giants at the neighborhood fire station pumpkin patch. We picked up three pumpkins small enough for my daughter to pick up. The pumpkins are "take what you want" for a donation, whatever you want to pay. The money goes to the Fallen Firefighter Fund. I've never seen a white pumpkin before. Its huge! That's a unique idea for a fundraiser. Thanks for sharing! Wow, that's quite a pumpkin. I, too, have never seen a white one. What a great cause to raise money for. 230 pounds?! Whoa! Our squash is downright puny compared to this! My goodness, that is a big one!!! I doubt anyone picks that one up to take home. 230 lb. albino pumpkins!? Idaho isn't just famous for potatoes any more. I only have one question. How many pumpkin pies can we get from a 230 lb. pumpkin??? I haven't had any pumpkin pie yet this year but I'm looking forward to it. On Saturday evening I was at a reception & there were white pumpkins as decorations. We were wondering what the color of the flesh on the interior was? Someone who has a working farm said he thought the interior was dark? Do you know? Gee. What does one do with a 230 pound pumpkin? Do the seeds grow other HUGE pumpkins? Hi Ilse - well, we've carved white pumpkins, often called Ghost Pumpkins, in the past, and the insides looked just like a regular pumpkin. We've never seen inside one this huge, though. And the firefighters sent me a note to let me know they grew the giants, as well as 500 other pumpkins in the lot behind the fire station. I think one this big is strictly grown for bragging rights.